Superheroes to the rescue? Playing like monkeys in the Jungle? Waddling like penguins in the Arctic? The possibilities are endless in this fun resource designed for the preschool program setting. 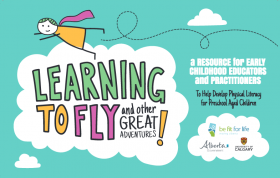 Build a 20-30 minute lesson plan from activities that help to develop stability, locomotion and object manipulative skills and you will be off on a great adventure! Developing physical literacy has never been this much FUN!